If you've been searching around for reviews of The Dark Knight Rises, you may notice a certain pattern: near universal praise for Joseph Gordon-Levitt. The young actor steals nearly every scene he's in, and is easily one of the best parts of the movie (as noted by both Katey and me in our respective reviews). And while audiences will get a full dose of Gordon-Levitt this weekend, there's a lot more on the way, including the awesome looking Rian Johnson film Looper. We've already seen a couple of trailers for the movie and the occasional still, but today Sony Pictures has delivered something even cooler. The studio has launched the official Looper website and while it's not fully functional just yet, it's a pretty badass and exciting site. Operated through scrolling up and down, the site provides not only new images, a plot synopsis and cast information, but also features definitions for new slang featured in the movie (such as ones for the terms "Looper," "Gat" and "TK"), cool looking games and what appears to be the start of a new viral campaign that allows you to join The Looper Network (though that's still coming soon). In addition to all of that cool stuff, the site also has 12 never-before-seen stills from the movie. You can check some of them out below and head over to our film database to see the full gallery. 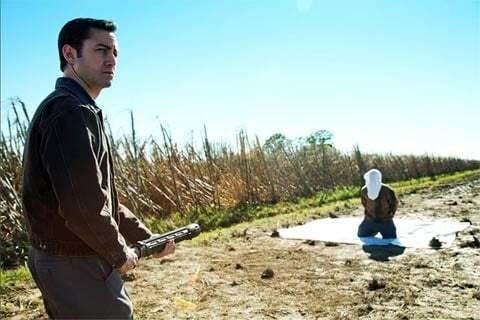 Looper is set in a future where time travel has been invented, but has been deemed illegal. Mobsters take advantage of the technology by sending their marks 30 years into the past where an assassin - called a looper - is waiting to kill the mark and collect their reward. Joe (Gordon-Levitt) has made a sweet living out of being a looper and is living the high life, but everything crashes down when the mob decides to close the loop and send Joe's older self (Bruce Willis) into the past for elimination. The film also stars Emily Blunt, Piper Perabo, Paul Dano, Noah Segan and Jeff Daniels. Look for it when it arrives in theaters on September 28th and for more info head over to our Blend Film Database.